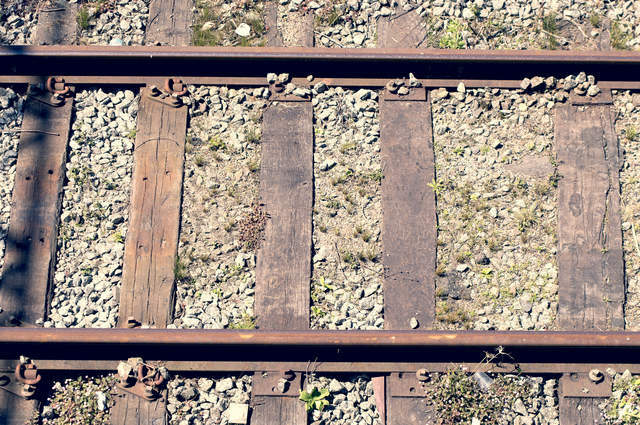 Disused railway sleepers image by Jaboticaba Fotos (via Shutterstock). Railway sleepers: we at Theo’s Timber are surrounded by the things. They form part of the Metrolink trams which pass our yard (a Very Belated Happy 25th Birthday by the way). The main line into Manchester Victoria station is close by too, as we have said before in previous postings. Today’s railway sleepers are made from steel or pre-stressed concrete. The former has replaced wooden sleepers on provincial services, whereas concrete sleepers have been common on inter-city routes over the last 60 years. With wooden sleepers shunned for steel and concrete, they have become a common feature in our homes and gardens. A variety of hardwoods and softwoods are used in wooden sleepers. Historically, Jarrah and Oak woods have been used. In untreated form, Greenheart, Mora, Karri, and Azobe woods are also commonplace, and they can last for up to a hundred years. Density and elasticity are among the strongest points of wooden railway sleepers. They are also the most lightweight option. Hardwood Oak sleepers are popular in the home. They are a popular option for outdoor decking and floating shelves. Typically, they are also used for raised beds. Furthermore, they can also be used imaginatively as part of patio furniture, or a bed base. Instead of fresh timber, wooden sleepers can add character to your decking. They are good for stairs – inside the home as well as your garden path. If you have any queries about using railway sleepers for your garden, or as a floating shelf, why not talk to us on 0161 834 6789? We will be happy to get back to you as soon as possible. Theo’s Timber, 10 April 2017.